Simple to make right in your slow cooker and the best fall recipe. 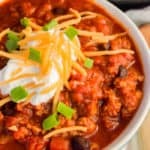 Serve this Slow Cooker Turkey Chili with warm cornbread or crackers and maybe around a campfire. Chili is easily one of my favorite recipes. Honestly, I love just about anything that tastes good with sour cream in it. 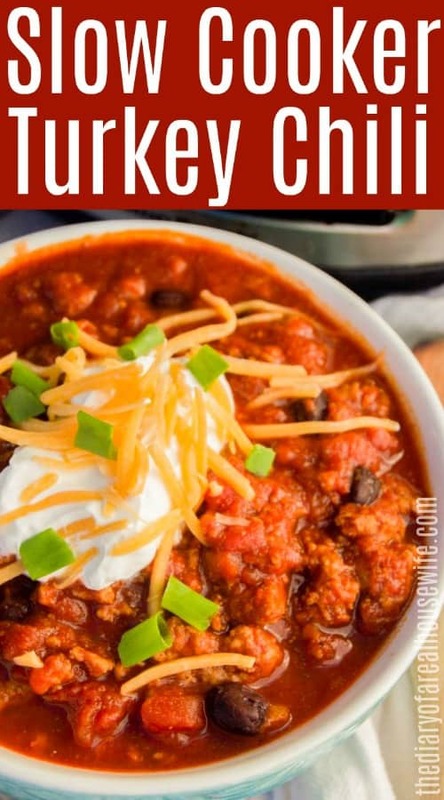 Chili has that warm and cozy taste and has to be served every fall and winter in my house. I love making it for a big crowd or just making a big pot to have leftovers for lunch during the week. My husband loves Chili also and this is more his type of chili. Growing up in Cincinnati chili looked a lot different. No beans and really thin. We served in on spaghetti or hot dogs not usually in a bowl. I love it but have come to love both types. 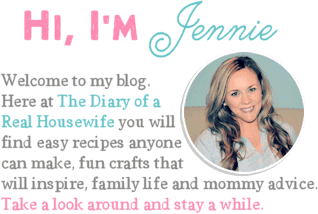 If you have not tried or heard of Cincinnati chili then stop by and check out my recipe here, Cincinnati Chili. We usually eat chili topped with sour cream, cheese, green onions (for me), or even tortilla chips (for the hubby). After I cook up my ground beef I just tossed everything into the slow cooker and gave it a good stir. Meanwhile, I enjoyed the fall weather that we have been having and played outside with my little ones. 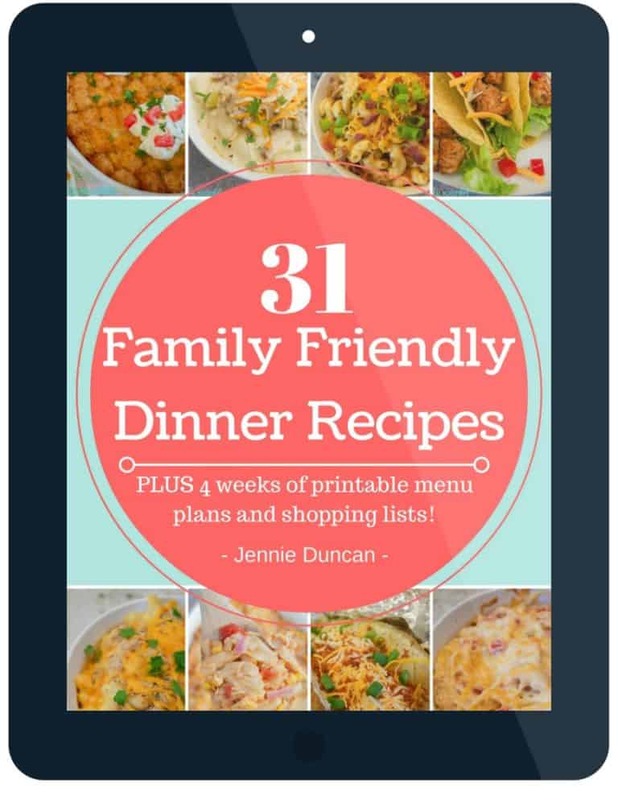 The perfect kinds of dinners are made in the slow cooker while I spend time with my family. 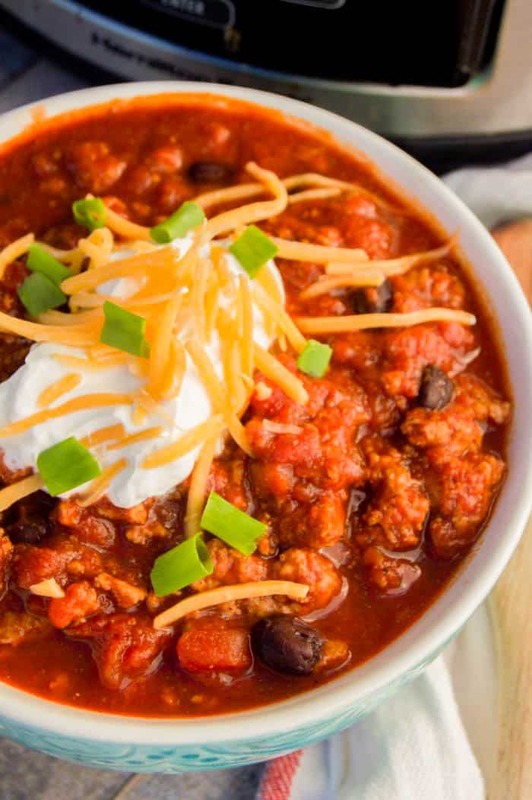 Step one: When making this chili in your slow cooker you want to start by coking and crumbling your ground turkey. Once it’s cooked drain the fat and add it to your slow cooker. Add remaining ingredients and stir together well. Step two: Now all you need to do it cook it. I serve mine with shredded cheese, sour cream, and diced green onions. Add your fully cooked ground turkey to your slow cooker. Add remaining ingredients and stir together well. Cook for 6-7 hours on low or for 4-5 hours on high. Top with shredded cheese and sour cream and serve! Ooo!!! This looks so yummy!!! 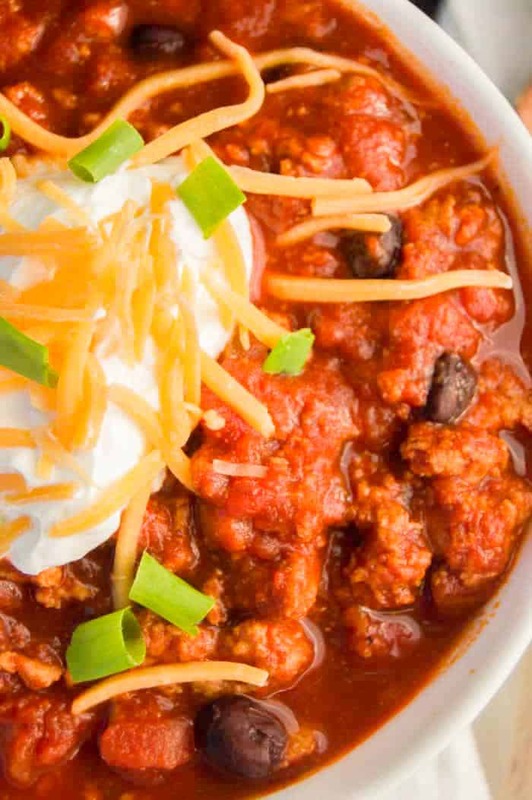 You can’t go wrong with chili! Yum! This looks great! I actually made chilli tonight (but a veggie version). Will have to give turkey mince a try next time! Hi there! Do you add water or any kind of liquid to the ingredients? Or do you just add the juice from the cans? I just add the juice from the cans because I like this to be a thick chili but you can add some broth as needed. Hope you enjoy the recipe Katie! Do you have to cook the turkey first? I want to put this in the crockpot early in the morning before I go to work and come home ready to eat. Yes I cook the turkey first in a skillet then add it to my slow cooker. Hope you enjoy it Lisa! This was great, I did this with the crockpot chili packet in there too! Tomorrow will be my second time making this recipe. This is the best chili recipe I’ve ever made! Yah!! So very happy to hear this! I want to make this recipe for a girls night I am hosting! I was wondering about how many servings can I get from this recipe? Thanks! Hi Rose! This recipe should easily serve 6 and you can always add more means to make it go further. Hope you enjoy it and have a wonderful girls night!